Gymnast Li Ning, who won the first medals for China at the Los Angeles Olympics in 1984, "flies" over the National Stadium to light the Olympic flame during the inauguration. Photo: EFE / Kay Nietfeld. BEIJING.-The Beijing Olympic Games got underway with a dazzling opening ceremony planned by China's most successful film director, Zhang Yimou. It included a display of fireworks, acrobatics and music. The event started at 8.08 p.m. on August 8, or 8/08/08 in the Bird's Nest, China's national stadium. An army of 2,008 drummers pounded out the countdown to the Games. Thirty-five thousand fireworks lit up the sky above 10,000 dancers and performers in the stunning stadium. Twenty-nine colossal "footprints of fire" shot into the sky and "marched" through the city to Tiananmen Square in a dazzling, rolling display of pyrotechnics. The large cast sang the words of a famous Confucian greeting: "Friends have come from afar, how happy we are." There were eighty world leaders, among them US President George W Bush and Russian Prime Minister Vladimir Putin. Around one billion people were expected to watch the ceremony on television. The show was a celebration of ancient Chinese history. Performers wore lavish costumes from different imperial dynasties. The 204 national teams paraded in a sequence based on the number of strokes it takes to write their names in Chinese, not in the traditional alphabetical order. 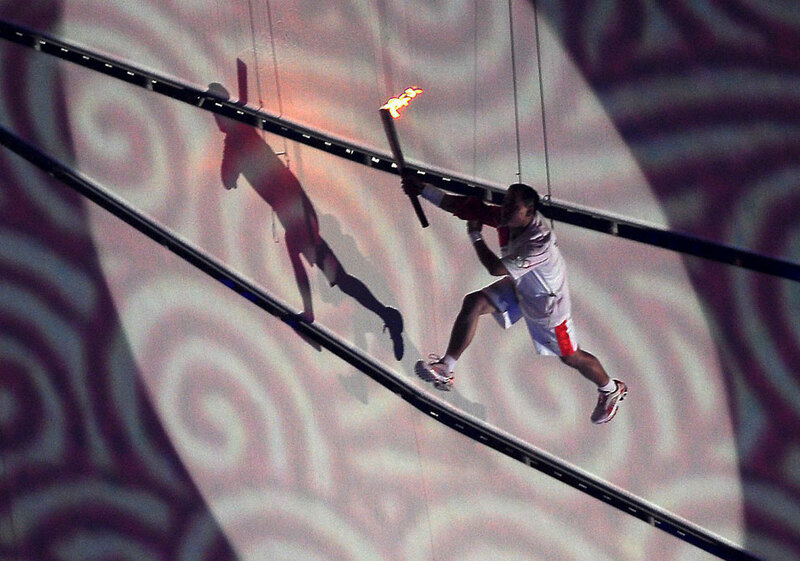 The games officially started when former Chinese gymnast Li Ning used the Olympic torch to light the Olympic flame. Chinese President Hu Jintao said: The Beijing Olympic Games is an opportunity not only for China but also for the whole world. We should carry forward the Olympic spirit of solidarity, friendship and peace, facilitate sincere exchanges among people from all countries, deepen mutual understanding, enhance friendship and rise above differences, and promote the building of a harmonious world featuring lasting peace and common prosperity." The time of the ceremony was selected based on the number eight, a lucky number in China. The time was 8.08pm on the eighth day of the eighth month of the eighth year. Let the Games Begin - 08-08-08 - at the Norton Museum of Art!